As in previous winters our gardening activities have been hampered by inclement weather, so work has been done to aquariums instead. They tend to get rather neglected in the other seasons of the year. We decided to redo our most recently set up aquarium, which we had tried as a soft-water tank. This had been an almost complete failure as we had hoped to grow soft-water Cryptocoryne species and Crystal Red Shrimps. 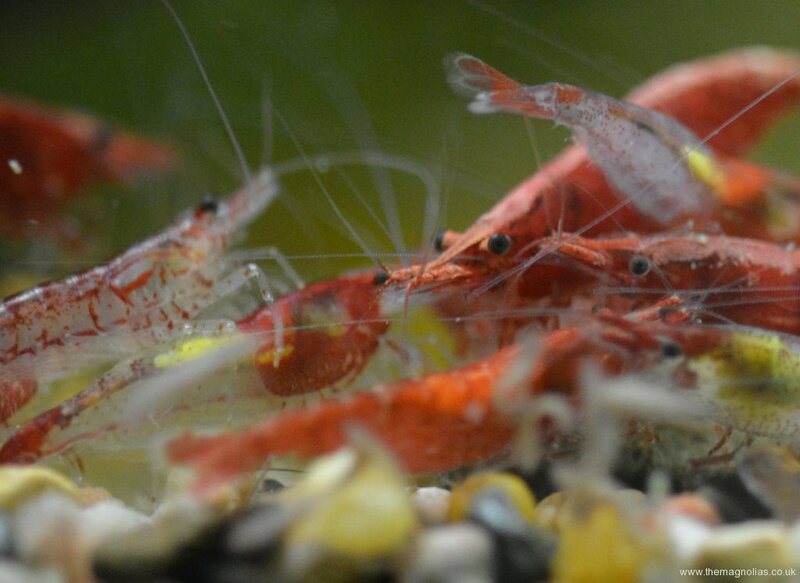 Probably, due to lack of water changes the shrimps never bred, and in the end the Crypts faded away. We were left with a few Pygmy Rasboras and small Tetras and a collection of mosses. The substrate we used was a man-made Japanese material believed to be made from paddy field clay and the tank had been filled with rain water from our shed roof. The original bog-wood features were reused and many of the attached mosses have re-grown well. We stripped out everything and put an inch (2.5cm) of garden soil in the bottom followed by about three inches (7.5cm) of normal aquarium gravel. We then filled with Essex tap water. Our good friend James had decided to close his tropical fish shop, Wayside Aquatics, after thirty years and to reduce the number of his own aquariums. He very generously donated several unusual Cryptocoryne species which are ok in hard-water. These were two clones of C. affinis plus hudoroi, cordata, usteriana ‘Red’ and pontederiifolia. 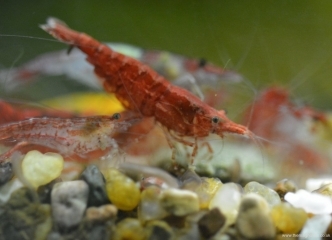 A couple of weeks after planting up the aquarium he also gave us a good number of Neocaridina heteropoda shrimps in red, yellow, orange, blue and ‘Rili’ which have red at each end and clear in the middles. Mixing the varieties is undoing all the good work of selective breeding and the results of interbreeding may be a disaster, but we will see. I have recently counted over a hundred babies from about 1mm to 4mm long. We are only going to have Ottocinclus cat fish in this tank, as they are said to be baby shrimp safe. 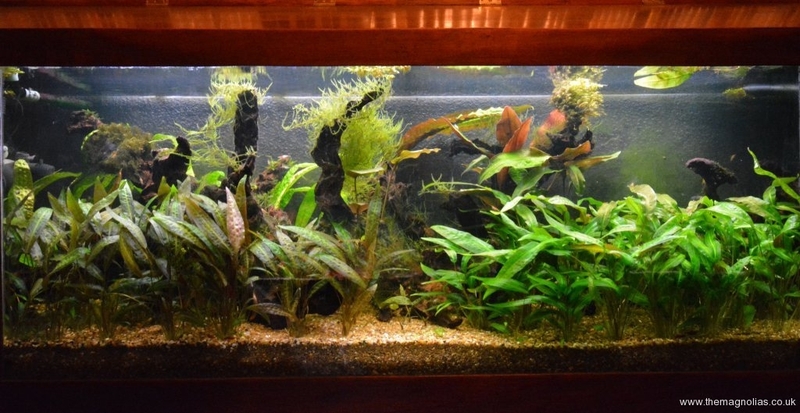 This entry was posted in News and tagged Aquarium, Cryptocoryne by Roger Hammond. Bookmark the permalink. Cheers James, but they are mostly your plants and shrimps.